Food Lover’s Odyssey turns 10 years old today! Exactly 10 years ago today, I began with a “hello world” pastry post from Paris. I thought it would be fitting to celebrate today with another classic French pastry, just as I started 10 years ago. 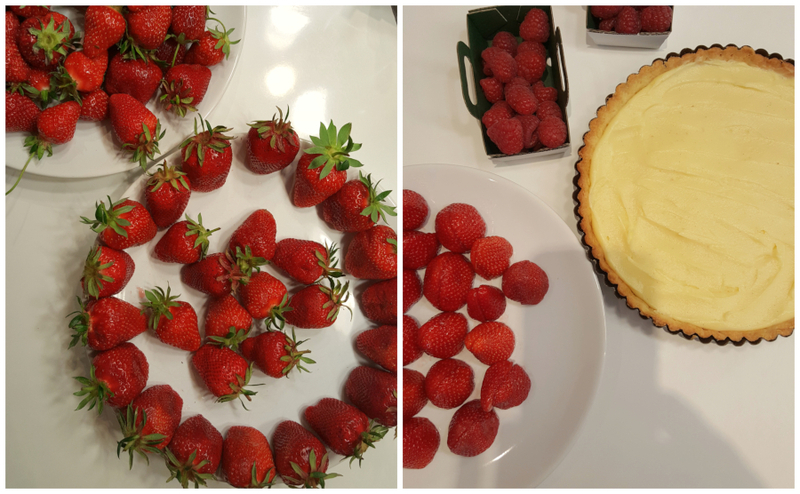 This time the pastry is the classic, French Strawberry Tart or Tart aux Fraises. TEN YEAR Giveaway (The Countdown)! This is such a big anniversary for FLO. 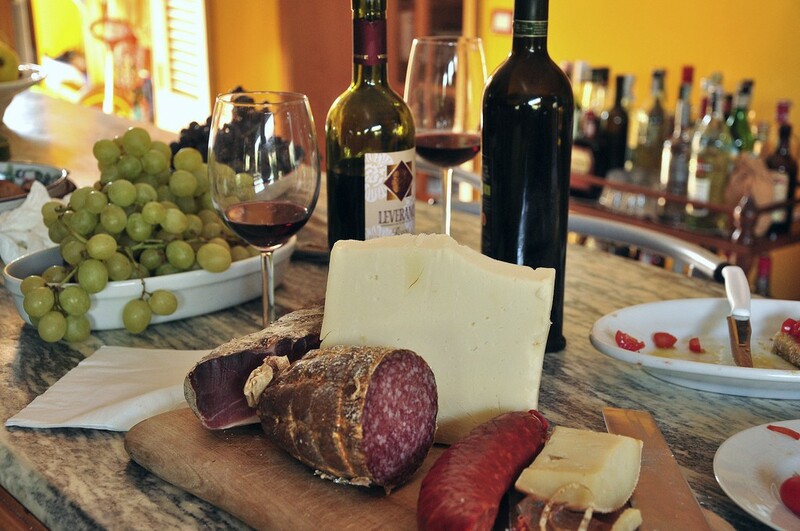 My initial plan ten years ago was to offer French and Italian-themed cooking classes in California, but things grew in a very different direction, towards France and Italy. Although things are a little different than the initial plan, I am so glad Food Lover’s Odyssey is what it is today. I want to THANK YOU, all of you, for following along here and on social media for the last 10 years, or for the last day. Thank you to all those who have joined a vacation, a pastry week, and/or a cooking class. I remember each and every one of you. It is always a pleasure meeting and spending time with guests. I appreciate all of you. From that first group of five who joined me in Puglia in 2012 to my last private group this last October in Sicily. Thank you for supporting my small business in this big world of culinary travel. I realize that this year is a milestone, and a culmination of a lot of work. I want to celebrate in a big way and get ready for, hopefully, another ten years of FLO. New additions is the theme for the year. Two of those additions I’ve already announced: The Food Lover’s French Road Trip and the Cooking Week in Provence. The next one, comes with a giveaway. 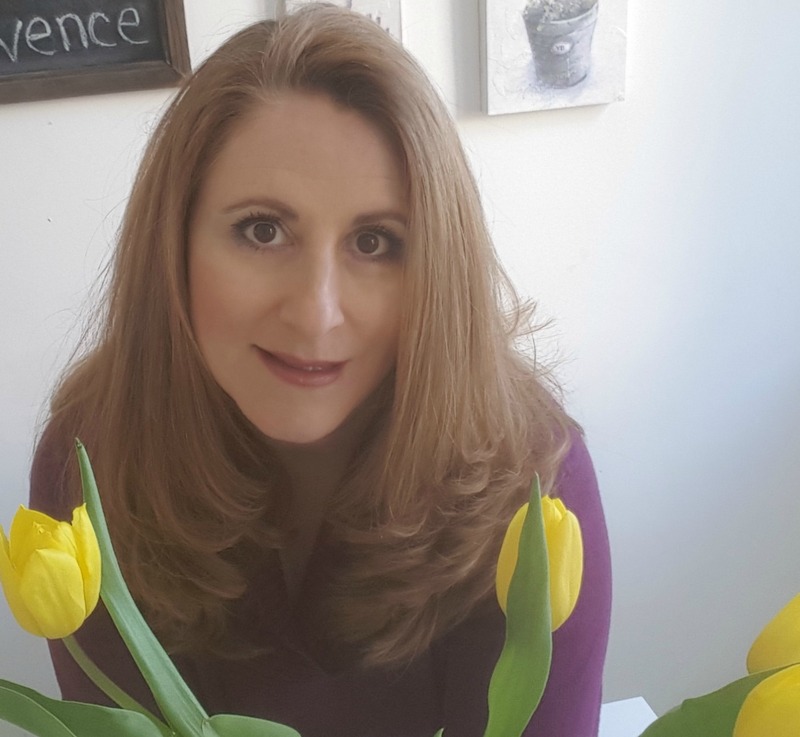 This post starts a week of celebrating and a countdown leading up to that big giveaway and announcement on Thursday, April 18, 2019. Stay tuned! I’ll be making the giveaway announcement via my newsletter and a blog post, so please make sure you have subscribed so you receive the announcement. You will also see mentions of the giveaway on our Facebook page and Instagram pages. 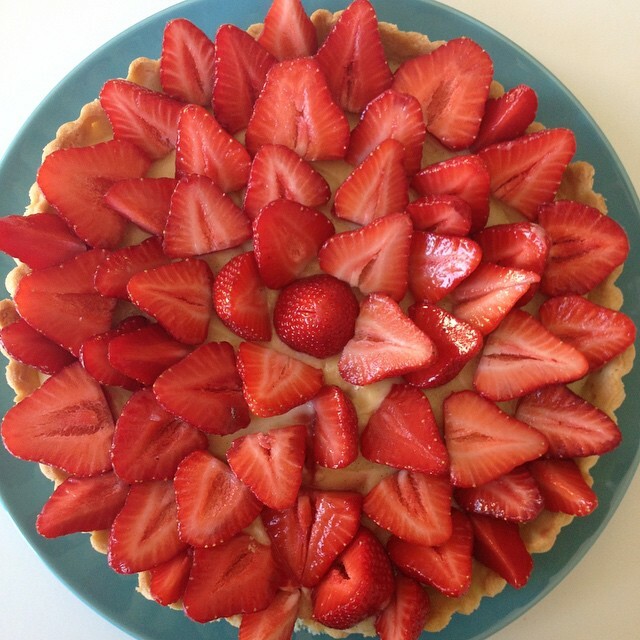 In the meantime, there’s this French strawberry tart recipe…. 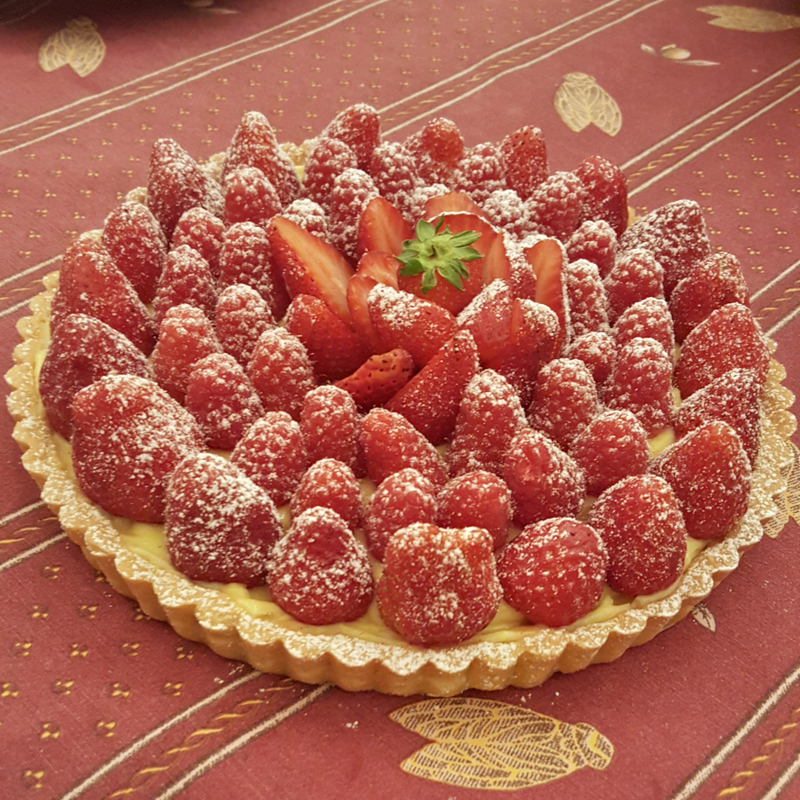 This French Strawberry tart is always a star of our French Pastry-Making week in Provence as you can easily find strawberries in Provence from mid-March until August, and sometimes all the way through September. The springtime strawberries that in abundance now at the outdoor markets in Provence mainly come from Carpentras. 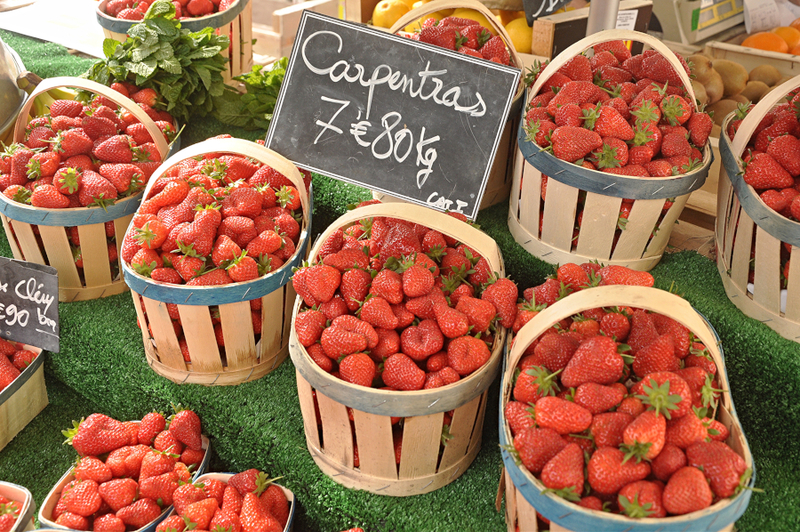 Carpentras Strawberries have the designation, “Fraises de Carpentras.” This means that those strawberries are from the area around the town of Carpentras, just south of Avignon. There are three strawberry varieties from Carpentras: the Clery, the Gariguette, and the Ciflourette. The Gariguette and Ciflourette are more elongated and more acidic and tart. The Clery are the shorter, rounder and bright red strawberries. They are also the sweetest. These are the ones I like to use for this tart and for the Fraisier that we also make during French Pastry Week in Provence. I shared the recipe for the Fraisier to celebrate my first FLO anniversary. At Provencal markets, you can also find Charlotte and Mara de Bois strawberries. When the Clery strawberries are gone from the markets, I switch to the Mara de Bois. They are smaller, still round, nice and sweet, and with a hint of wild strawberry flavor. They have a longer season than the Clery, sometimes available through September. I understand that outside of Provence, and France, you may not be able to find more than one type of strawberry. That is ok. Use the best strawberries you can find. April is the perfect time for strawberries in the Northern Hemisphere and to make this tart. Remove the chilled dough from the refrigerator and roll the dough out to between 1/4 and 1/8-inch in thickness. Roll the dough between two pieces of lightly-floured parchment paper. Place the dough into the mold. (If making individual tarts, cut out circles a little bigger than the tart molds you’re using.) Gently press the dough into the bottom corners and along the sides of the mold. Press only enough to make sure that the dough is touching the corners and the sides of the mold. It should not be pressed into the mold. Cut the excess dough off the top to form an even edge that rises just barely, about 1/16 of an inch, above the rim of the mold. Place the mold(s) onto a baking sheet. Generously pierce the crust with a fork to leave holes for steam to release while baking. This prevents the dough from shrinking and deforming itself while baking. Refrigerate the dough in the molds for 30 minutes. Blind bake at 180°C/375°F. Blind baking means that you bake only the dough, unfilled with ingredients, and weighed down with either ceramic pie weights, beans or dry, uncooked rice. (I use rice). Place a layer of parchment paper on the pie dough before adding your weights/rice/beans. The parchment paper should be long enough that it extends above the pie mold enough so that you can pick it and the weights/rice/beans up midway through the baking. Baking time depends on the size of the molds and your oven. For the 8-inch tarts, blind bake with the weights for 10 – 13 minutes minutes, until the dough has set and looks dry. Then remove the weights and parchment paper, and bake for another 8 – 12 minutes, until the dough is a light golden color. Remove from the oven and cool completely before filling. In a large sauce pot and over medium-high heat, bring the milk, vanilla bean scrapings, and half the sugar to a boil. As the milk is heating, whisk together the other half of the sugar and the egg yolks until the mixture is combined and has lightened in color. Then whisk in the cornstarch. Once you have completely combined the milk and egg yolk mixture, pour this mixture into a new and larger sauce pot, and over medium to medium-high heat, bring it to a boil. You must whisk/stir constantly and vigorously while cooking the pastry cream and make sure that your whisk or spoon is constantly moving the mixture from the bottom of the pot. This ensures that you will not scorch the pastry cream and give it a bitter taste. Once the mixture boils, keep stirring/whisking it over the heat for about 30 seconds more, to cook off the starch. Remove it from the heat and let cool slightly until most of the steam has stopped coming up from the mixture, stir occasionally so a film does not start forming. Dot the top of the pastry cream with the cold butter and let the butter almost melt before stirring it into the pastry cream. Pass the pastry cream through a fine mesh sieve into a bowl. Place the mixture over an ice bath and let cool for 10 minutes, again stirring occasionally so a film does not form. Spread the mixture into a 13×9-inch glass dish and cover with plastic wrap (the plastic wrap should be touching the pastry cream, so a film doesn’t form). Refrigerate until the pastry cream is cold. Start by gathering the same-sized strawberries together. Fill each baked tart shell about three-fourths of the way with pastry cream. Spread the pastry cream so that it lays evenly. In a decorative manner that you like, place the strawberries on top of the pastry cream. Using a small sieve/strainer, dust the top of the tart with powdered sugar. Ideally you would eat the tart as soon as it is ready. If not, you should refrigerate it and eat it within the next hours. It will last two days in the refrigerator. (Note: The tart base will become soft after a day in the refrigerator.) Bon Appetit! Note: The powdered sugar acts a little as a preservative to keep the strawberries. 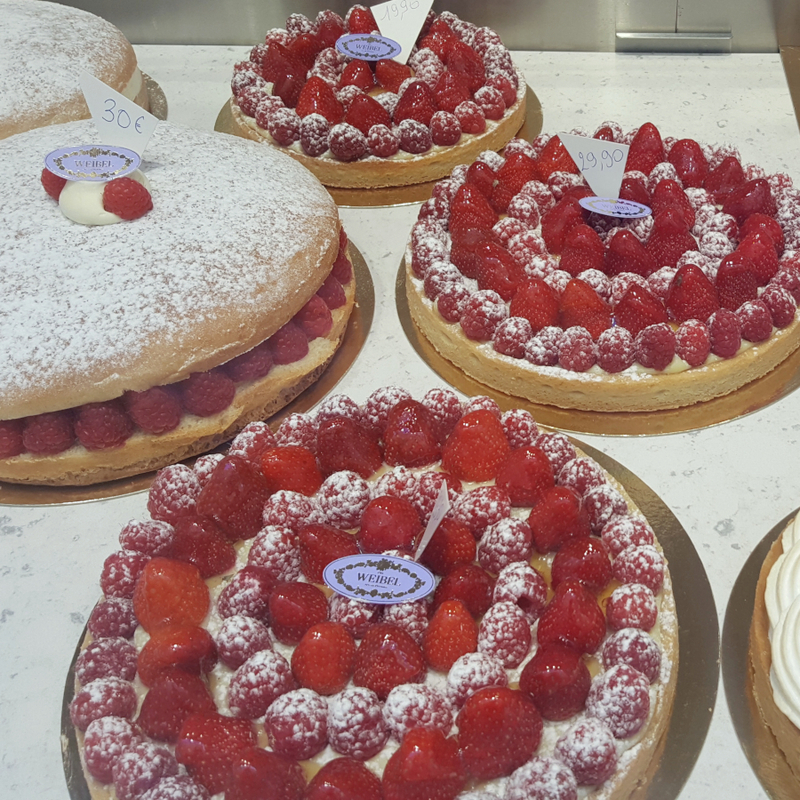 Many French pastry shops use what is called nappage to cover and preserve the strawberries and other fruits. This is basically a neutrally-flavored jelly, like apricot jelly, that you melt and brush over the strawberries. The nappage is a better preservative than the powdered sugar, but I think it changes the tastes of the strawberries and makes it too sweet. And, when I make this French strawberry tart, it never lasts long enough for the berries to go bad.